Zebra's industrial printer ZT510 is the optimal choice for combining top performance with low costs in production, shipping or warehousing. It comes with all the core features that you expect from an industrial printer for medium to high volumes – without the additional costs for unnecessary equipment. The devices produce labels at up to 305 mm/sec. 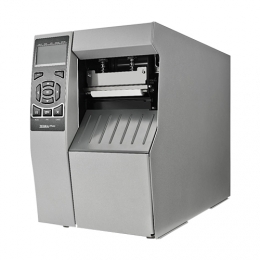 at a resolution of up to 300 dpi, as you wish in either direct thermal or thermal transfer mode. The ZT510 builds upon the qualities of the predecessor, 105SLPlus, and impresses with its solid construction in connection with 2 GB Flash memory and extended management possibilities. Add to this a high degree of reliability and a long life cycle, which reduce interruptions to a minimum. With diverse accessory options you adapt the printer individually and integrate it easily into existing infrastructures, thanks to Link-OS Cloud Connect. With the ZT510 you are well equipped for all the challenges of the coming years.